You are here: Home / choosing a Kitchen Appliance / Just How Much Energy is That Appliance Using? 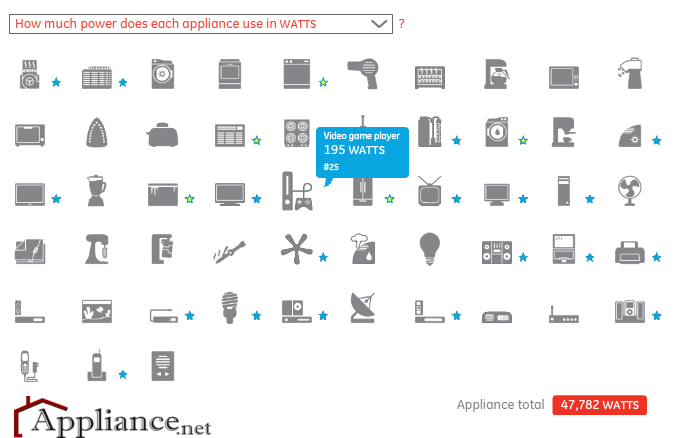 Just How Much Energy is That Appliance Using? My computer stays on through the week, only getting shut off on the weekend. My answering machine and TV stay plugged in, their little red lights glowing in the night. I do turn off the treadmill between uses and the DVD player too. This is a really cool tool that calculates how much power each appliance consumes in watts or kilowatthours. Alternatively, you can see how much each appliance costs to use in dollars, and how much it consumes in equivalent gallons of gas. Some appliances are marked with a blue star indicating that an EnergyStar model is available or click on the green star to see how much energy (and money) you’ll save with a new appliance.